We have a new story just in from Jason Offutt’s blog, “From the Shadows”. We here at GT are always happy to promote Jason’s site as he always has something interesting going on over there. What makes it even better is that these are allegedly true encounters submitted to Jason from all over the world. This particular story is no exception as I’m sure all will enjoy it. 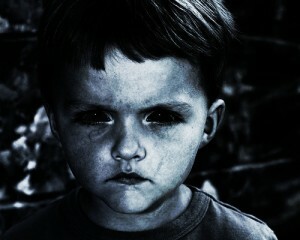 We’ve all read spine tingling stories about Black Eyed Kids. Apparently they are alive and well in Ireland as a woman relates her encounter with this terrifying phenomena. Late one night in 2009, an 18 yr old Carris Holdsworth encountered two young boys as she was walking home in Lisburn, Norther Ireland. Carris first saw the youths in the front yard of her flat and felt immediate danger. Carris’ experience has all the classic components of a BEK encounter. The following is a detailed account of that encounter. It was warm the night Carris Holdsworth walked to her apartment from a friend’s house in Lisburn, a city of 71,465 in Northern Ireland near Belfast. Then 18-year-old Holdsworth didn’t know terror waited for her at home. Here at Ghosttheory we’ve had lots of experience with BEK phenomena as you can see here. Kind of creepy as I am from Northern Ireland and it’s never really used as a place for scary stories. Highly doubt it’s true though but it’s still creepy. No, with these particular kids it’s not a medical condition. there are so many stories of black eyed kids and they are all the same, they all ask for something and are usually always in pairs and always have pitched black eyes. i believe it is something paranormal/demonic.